I’ve gone through some additional cards and have some more data on squirrels from the deployment that had squirrel captures earlier this spring. As with the results for Pileated Woodpeckers foraging on hickories, I think this tends to exclude squirrels as the source of extensive scaling on standing mature boles. That will be the subject of the next post, which should be up within a week. In the interim, here’s the October trip report I’ve been promising. We had no possible encounters and found little suggestive feeding sign this time around. I spent the first two days with Matt Courtman (and his brother on the second day) in the vicinity of last November’s Saucier sighting. The first day was rainy enough to depress avian activity but not quite enough to keep us indoors. The ground was wet but mostly not unbearably muddy. The second day, we found a scaled sugarberry (Celtis laevigata). Tanner called this species hackberry, which is the common name, but it’s not to be confused with the common hackberry (Celtis occidentalis), which is found farther north. Despite the appearance, the tree was either barely alive or very recently dead, since leaves were still visible on the upper branches. Sugarberry bark is thin, and it can fracture and break off in large chunks. Pileated Woodpecker is a possibility for this type of scaling, but it is interesting nonetheless, and it strongly resembles ivorybill work on a sugarberry (mislabeled as a “gum”) photographed by Allen and Kellogg in the Singer Tract. There were also horizontal bill marks on the surface of the wood. These were interesting and perhaps suggestive; these superficial scratches are the only horizontal markings on sapwood that I think may be suggestive of ivorybill. There is so much potential habitat in this area that I’m unsure how to go about searching it, given our small team and limited time and resources. I spent the balance of my time in our main search area. Tommy Michot and our new team member (I hope to include some of his photographs in a future post) joined me for part of the trip. Because we now have 8 functioning trail cams in the field, much of my time is devoted to servicing the cameras and changing cards. On the last day, Matt, Lauren (his wife), and I explored a very narrow corridor of near old-growth forest that stretches for several miles to the east of the main search area. We also spoke to someone who had ivorybill sightings, though not recent ones, in the area discussed in this post. We found more fresh beaver sign than I’m used to. The tree shown is an ash, uncommon in our search area. It was a very snaky trip. I had a few near misses with cottonmouths. A coral snake was a major highlight, spotted and avoided on the road by the new Coyote. I was even able to capture it briefly on video before it buried itself. And all the rain meant fungi were plentiful (including a meal’s worth of chanterelles, not shown but brought home and enjoyed). There was plenty of woodpecker activity, though it was sporadic, and there was not much drumming. It’s always tough to get good pictures with leaves on the trees, but this Red-headed Woodpecker was cooperative. In all my years of searching, I had never found the remains of a Pileated Woodpecker until the trip before this one. It’s a little unnerving for this to happen back to back. I also found Red-shouldered Hawk remains (though not in the same vicinity). I worry that these birds may have been shot, though there’s no evidence for it. The remains, feathers and a few bones, were on top of a log, suggesting that a raccoon was the last creature involved. One of our trail cams was hit by a falling limb, and was aiming skyward when found. It appears to be functioning and has been re-aimed at the target tree (where there was an intriguing capture in the summer of 2017). We didn’t find much interesting scaling, although some of the work we found was on oaks, which is rare. I don’t know the tree species, and Pileated Woodpecker is a possible source, but the work below is unusual. Edith Kuhn Whitehead once told Frank that cambium shredding, possibly like that shown, is suggestive of ivorybill; however, I only heard this second-hand and am not clear about what she meant. The sunrise on my last field day was spectacular. Stay tuned for squirrels . . . The original post from last week is below the updated material. It provides some important background, and I encourage you to read all the way and watch the clips. A couple of prefatory notes for new readers: first, this discussion pertains to hickories only because the bark of trees in the genus Carya has characteristics that make it much harder to remove than any other type of tree in the southeastern U.S. Second, the video clips are time-lapse composites of images shot at 20 second intervals. I’ve gone through most of the June-August captures from the deployment discussed in the original post and have found a number of additional examples showing one or two Pileated Woodpeckers foraging on the scaled areas. I’m including those captures and a couple of individual frames that should help illustrate what’s being described. Pileated visits to the target tree spiked starting on June 17, with two visits on that day, one on June 18, and one on the 20th, 23rd, 24th, 25th, one on July 2, and two on July 3. There were no hits between July 4 and July 10 and no hits between August 2 and August 12. Imagery for July 11-August 1 has yet to be reviewed. Of the sequences below, the ones from June 17, 18, and 25 are probably the most informative. They suggest that when Pileateds remove hickory bark, even on a tree that is considerably more decayed than some on which we’ve found scaling, they do so by focusing on the scaled edges, and when they do remove bark, they’re more likely to dig through it (as I’ve hypothesized) than to pry it off in flakes. We have now obtained 22 sequences of Pileated Woodpeckers investigating or foraging on and around extensively scaled hickory boles, the first one dating back to 2013. Some captures involve lone birds and others involve pairs. Duration of the visits ranges from under 1 minute to upwards of 20 minutes. In these captures, Pileated Woodpeckers remove bark in modest quantities and with difficulty, when they remove it at all. They never scale extensively or remove bark in pieces approaching the size of those found under the homepage tree, and there is nothing in the footage obtained that suggests they are capable of doing so. I think this tends to exclude Pileated Woodpecker as the source of the initial work on hickories. These stills should shed additional light on Pileated Woodpeckers and bark removal. The additional sequences are below, followed by the text of the original post. I just returned from Louisiana where I visited both the search area and the location of Joseph Saucier’s sighting last year. There were no possible encounters on this trip and just a little of potential significance ivorybill-wise. I plan to post a trip report within in the next week or so and hope to get to the long-promised evidence post in November. There may be additional posts about trail cam results if anything significant shows up. There are numerous cards to review, and I have a lot going on in a variety of arenas, but I’ll do my best to keep you all updated on a regular basis. At Tommy Michot’s suggestion, we’re also going to start quantifying our results, including all hits that we note, regardless of what kind of animal is involved. Those results appear at the end of the post. Like two other current target trees, which are sweet gums not hickories, I selected this one because it had already been scaled (extensively in this case); the remaining (majority of) targets have been chosen in hopes that they will be scaled in the future. For most of the hickories we’ve found, including ones that I’ve watched for extended periods of time, the bulk of the scaling appears to have been done in a single visit. We’ve found only one example of a tree with truly fresh scaling, the home page tree. That work, found in May 2013, was probably no more than a week old, since the trunk was wet with sap and the tree died soon after. Numerous large chips were found at the base. All other examples appear to have been less recent, and in most instances, flooding appeared to have washed bark chips away. After reviewing the captures, I was inspired to revisit the history of this particular snag, which Phil Vanbergen found in early March, 2017. It had been extensively scaled at that time, I suspect during the spring or summer of 2016 but possibly the year before. Phil found a few small chips at the base, but given the extent of the scaling, it is safe to assume that the overwhelming majority of the chips associated with the initial work had been washed away in one of the flooding events that had taken place during the intervening months. Phil shot this video of the tree, which shows the work extending from mid-bole up to the point where the crown had broken off; I later found what I believe to have been the crown, and it too had been scaled. Downed Hickory Top showing suspected ivorybill scaling. What sets this tree apart, is that there appears to have been a second extensive scaling event between March 2017 and March 2018 when I re-found it. While there had been a couple of floods in the course of the year, one large and a couple of medium-sized chips remained near the base of the snag, but it was apparent that most had been washed away. We deployed a trail cam on the tree in April, and one of the early frames from that deployment more clearly shows the extent of the second round of scaling, which reaches to near the base of the snag. A comparison of that frame, one from the beginning of the mostly unreviewed June-August card, and a capture from October 21 of this year shows how little bark has been removed by Pileated and other woodpeckers over the course of just under six months, with modest quantities removed from the bole, as indicated by the arrows. Pileated Woodpeckers are abundant in the area, but we have yet to obtain any evidence that they can remove large chunks of bark from the boles of live or recently dead hickories and scale them rapidly and extensively; indeed, all the evidence obtained thus far is that they remove bark in small pieces, slowly and inefficiently. Past observations suggest that the peak period for scaling of these hickories is between May and October. This appears to be the time frame when Hesperandra polita, the heartwood dwelling Cermabycid identified as infesting one of our scaled hickories, are likeliest to be found under the bark, as larvae and adults, or close to the bark layer in pupation chambers. The adults shown below were collected from under bark on June 28, 2013. In the case of this snag, at least, Pileated Woodpeckers removed little bark during the probable peak scaling period. The other side of the tree remains unscaled. In addition, we’ve found this work infrequently over the years, and the scaling on the lower part of this tree is the only new example of this kind of foraging sign found in the past year. All of this points to something other than Pileated Woodpecker, and I would suggest something rare, as the source of the scaling. Regarding the hits over the course of the deployment, I’m counting a “hit” as the appearance of an animal in a frame or series of frames, including interrupted series in which the animal reappears after a break of a minute or two. Impressionistically, this deployment is considerably more active than some. Even so, there were no hits on 17 of 62 days. The most frequent hits were lizards (mostly on the target tree): 46 hits. Passerines, including Hooded Warblers, Carolina Wrens, and Cardinals, were next with 24 hits, followed closely by squirrels with 22. Woodpeckers followed – 2 Pileated hits, one involving two birds, one Downy and one probable Yellow-bellied Sapsucker toward the end of the deployment. There were two hits each for beaver, deer, and moth or butterfly (one likely a luna moth). Finally, there was one apparent Barred Owl and only one hog, which was surprising given their abundance in the area. Stay tuned for the trip report . . .
I’m still planning a post on historic range and one on questions of evidence but thought I’d take this brief detour first. Tommy Michot is braving the Louisiana summer to change batteries and cards and to deploy an additional trail cam. We’re trying to service the cameras and replace the cards on a bimonthly basis. If there’s anything noteworthy on the cards, I’ll adjust my posting schedule accordingly. Look for the historic range post within a couple of weeks and the one on evidence a few weeks after that, before the start of search season in October. This is the first time I’ve devoted an entire post to someone else’s effort. Though I’ve received a number of other intriguing reports, I’ve chosen to write about this one for a couple of reasons. First, I want to counteract the oft-repeated notion that reports have dried up in areas where intensive searches have taken place. Second, the searcher in question has found intriguing feeding sign as recently as 2017. The images included in this post are among the most suggestive I’ve seen from outside our search areas and tick most of my Ivory-billed Woodpecker boxes. I use the word ‘among’ advisedly here, since virtually all the feeding sign imagery that I’ve found intriguing comes from the Choctawhatchee, including the images showing extensive work on this page from the site devoted to the Auburn search. Since that encounter, I have been back to the Choctawhatchee at least 10 times for a week at a time. I have hiked and kayaked many miles but have had no more encounters. I am not discouraged, though. Just that one encounter is enough to keep me going until I can get the video or photo of the bird. Rick informs me that he has had one possible sighting since the time he posted – a large woodpecker showing a lot of white – but that his confidence level is only around 50%. Rick suspects that the birds do much of their feeding in upland pines outside the floodplain, which is where he had his sighting. He shared a couple of images from the location of his sighting with the notations showing the bird’s path. Some of the scaling in this stand of pines is extensive, but none of it strikes me as being beyond the capacity of a Pileated Woodpecker. On its own, the work shown in these images would be unlikely to pique my interest. But as in our search area, fire killed pines in surrounding uplands are, at least potentially, a major food source. What really captured my attention were a couple of photographs. I found the first on Rick’s Facebook page. It was taken in 2017. The tree may be a tupelo, but I’m not sure. The bark is thin, and regardless of species, it is undoubtedly weaker and more easily scaled than hickory. There are also some hints of layered removal, akin to blonding. Nevertheless, a number of characteristics suggest Ivory-billed Woodpecker to me – the mostly clean edges, the lack of damage to or excavation of the underlying sapwood, and the targeted expansion of already large exit tunnels. This is unusual work, and it’s what inspired me to reach out to Rick for more information. Rick subsequently shared images of a scaled spruce pine he found in 2017. And while I’ve generally taken the view that there’s no way to recognize Ivory-billed Woodpecker work on conifers, this sign is strikingly similar to the work on hickories that we’re finding and also to the work of other Campephilus woodpeckers. The work is very extensive; there’s virtually no blonding or damage to the sapwood, except for targeted digging around the exit tunnels. It ticks my ivorybill boxes, save for the fact that it’s on a softwood and there was no chance to examine the bark chips. The final image below is a detail from one of our hickories for comparison. Except for a passing claim on Facebook about recent ivorybill sightings along the Pea River (a tributary) in Alabama, I’m not aware of other reports of sightings or auditory encounters in the area, but the fact that Rick has continued to find suggestive feeding sign, as recently as last year, suggests to me that the Choctawhatchee merits more attention than it has gotten since Auburn left. Of course, the same is true of many other areas, but this is the only instance where I’ve seen feeding sign that I strongly suspect is the work of Ivory-billed Woodpeckers. If I were looking for a place to search, the Choctawhatchee would be at or near the top of my list. A couple of initial housekeeping notes: I still plan to do a second, more conceptual post on ivorybill evidence, one on historic range, and possibly another on non-IBWO trail cam imagery. Look for those over the course of the summer. I thought this subject should take precedence and have changed plans accordingly. The photographs (other than my own), which I’m including in the largest possible sizes, are courtesy of bugwood.org (under a Creative Commons License) and Patowmack the trickster. Thanks to John Kearvell for inspiring me to pursue this subject. The emerald ash borer or EAB (Agrilus planipennis) is an invasive Buprestid beetle. The first known North American outbreak was near Detroit, Michigan in 2002. Since that time, the species has spread to 33 states and three Canadian provinces. 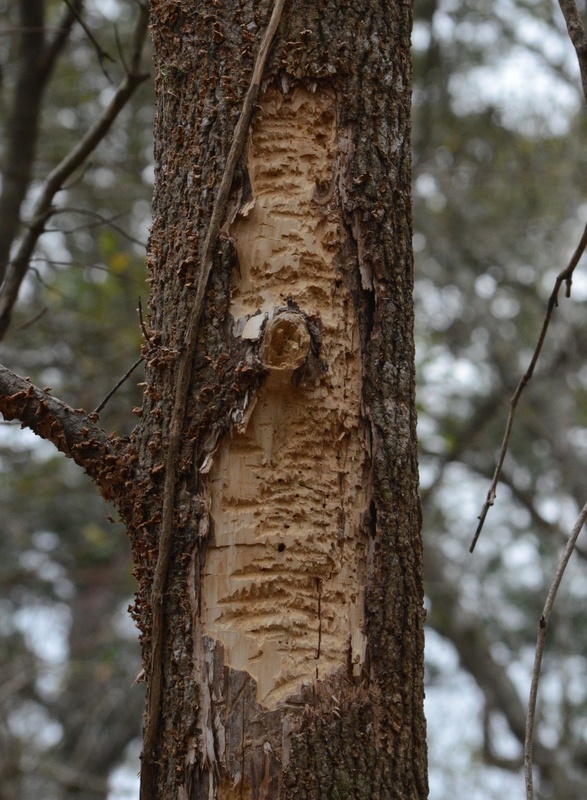 Bark scaling, especially by Pileated Woodpeckers (Dryocopus pileatus), is one reliable indicator of EAB infestation, and Pileated Woodpecker populations appear to increase as a result of outbreaks. Thus, there is now a large body of data on bark scaling that was not previously available for comparison with suspected Ivory-billed Woodpecker (Campephilus principalis) work. All of the numerous examples of white or green ash (Fraxinus americana or pennsylvanica) scaling by Pileated Woodpeckers (and presumably smaller woodpecker species as well) found online show “blonding” or removal of bark in layers. This may be due to anatomical limitations that preclude Pileated Woodpeckers from removing thick, tight bark in large pieces. Suspected Ivory-billed Woodpecker work on hickories – which have harder, tougher, tighter bark than ash – shows no trace of blonding or gradual removal. I think this excludes Pileated Woodpecker as the source of the hickory scaling. EABs are believed to have arrived in North America in packing materials. The first outbreak began near Detroit in 2002, and the species has spread rapidly since then, decimating native ashes wherever it goes. All indications are that this invasive insect will have an impact akin to that of Dutch elm disease or chestnut blight, concerted quarantine efforts notwithstanding. Because EABs were a recent arrival and had not been well-studied during the first decade of the 2000s, their relevance to the issue of bark scaling does not appear to have been recognized by the formal searches that were conducted during that period. Unlike many bole dwelling Cerambycidae, such as Hesperandra polita, which spend the bulk of their lifecycle in the heartwood and do minimal damage to the cambium, EAB larvae live, feed, and pupate just beneath the bark, eventually destroying the cambium. This causes the bark to fracture and sometimes to slough off by itself. In the very dramatic example shown below, I suspect that woodpeckers were involved in most, if not all, of the bark removal but only reached the sapwood well after the bark had started to loosen, fracture, and perhaps fall off on its own. Nevertheless, there are still signs of layered removal on the edges of the scaled/sloughed area. When I started researching this subject, I was unaware that the term blonding had been applied to woodpecker work in pursuit of EABs, but it has become a widely-used (and apt) descriptive. It refers to the appearance of ash trees or parts thereof, after woodpeckers have started removing the outer bark in pursuit of EAB larvae and pupae. The process of reaching the sapwood appears to be a slow one, and after examining hundreds of images showing of bark scaling on ash trees, I have been unable to find a single example that was devoid of blonding, even when very extensive work was involved. Kenneth R. Law, USDA APHIS PPQ, Bugwood.org Heavily infested Ash tree with Emerald Ash Borer and woodpecker activity in evidence. Some galleries exposed. Patowmack the Trickster’s photo is the most extensive example of apparent Pileated Woodpecker scaling on an EAB infested tree that I’ve been able to find. The tree appears to be fairly long dead – based on the extent of the superficial excavation (tunnels are no longer distinct), the apparent fracture in the trunk at the center of the frame, and on the apparent separation of the bark from the sapwood that’s most distinct on the lower right edge of the scaled surface. While the extent of this work is impressive, I’d suspect PIWO even in potential ivorybill habitat – based on the appearance of the surface, the state of decay and seeming looseness of the bark, and the blonding, which is most evident at the top and at the lower left. While smaller woodpeckers are responsible for some ash blonding, Pileated Woodpeckers are likely the primary source, especially when the work is as extensive as in the examples shown above. Images of Pileated Woodpeckers on blonded surfaces are considerably easier to find than ones involving other species. This brief video catches a PIWO in the act, on an extensively blonded tree, and points to the difficulty PIWOs face when scaling tight, thick bark. I have found blonding or its equivalent on a number of other tree species, so it is not exclusively related to any characteristics of ash bark. Rather, I think it is a function of Pileated Woodpecker anatomy. I have seen this on limbs, including sweet gum (Liquidambar styraciflua) limbs, in our search area and have described it as a “layered” appearance. Known Pileated Woodpecker scaling on a medium-sized sweet gum limb with evidence of layered bark removal or blonding. It may be possible for Pileated Woodpeckers to remove tight bark from small to medium branches without leaving traces of blonding, especially if the bark is weakened or it comes from a species (like sweet gum) that is relatively soft and thin. Removing thick bark from mature boles is something else again, and I suspect that even when bark has loosened considerably, traces of blonding will often be visible when the work is done by Pileated Woodpeckers. I have found one extreme example of suspected, extensive PIWO blonding on a bole in Louisiana. I think the tree involved is a sweet gum, but if it is an ash, it would be from a location well outside the range of the EAB today, let alone in 2011 when the tree was found. While blonding is easily visible on the trunk, it can also be recognized by examining bark chips. I have seen the equivalent of blonding on loblolly pines (Pinus taeda) in the southeast and on softwoods in Westchester County, New York. The bark of most conifers is weaker and less tightly adhering than that of most hardwoods, and it typically becomes easy to scale far more rapidly. This is why I long since abandoned the idea that softwood scaling might be suggestive of ivorybill, unless it involves extensive work on multiple large trees. I have also found it on live and dead hardwoods in Westchester County, NY. The first pair of images below, which I’ve posted previously, shows fresh, known Pileated Woodpecker work on a Norway maple (Acer platanoides) in my yard. (I saw the bird.) The second pair is from a local park. The snag, which I believe is a large sassafras (Sassafras albidum), appeared to be fairly long dead. Ash bark resembles that of bitternut and pignut hickories (Carya cordifromis and Carya glabra), so much so that an arborist mistook the pignut that grows outside my office window for an ash and advised me to monitor it for EABs. Testing bark hardness with a fingernail is one way to avoid confusion. Ash bark feels corky, whereas hickory bark is extremely hard. Last year, I wrote an in-depth post on the characteristics of hickory bark and the reasons it is exceptionally difficult to remove. I won’t recapitulate it here, except to say that hickory bark is considerably harder and stronger than that of virtually any other genus. It is also tighter when trees are dormant or dead, as these reposted tables suggest. The values shown are for shagbark hickory (Carya ovata), which is slightly stronger, tougher and tighter than bitternut or pignut. While white and green ash bark is considerably stronger and tougher than sweet gum and white ash bark is harder to remove from dead trees, neither species comes close to hickory in any category, except bark tightness when sap is flowing. I suspect that the extreme strength and toughness of bitternut and pignut hickory bark renders it impervious to blonding. Certain pignuts may be a partial exception, as the outermost bark layer on that species is sometimes slightly subject to flaking. I removed the outer layer of bark from the pignut hickory mentioned above to illustrate; the inner layer is very hard and tight. Our observations thus far suggest that Pileated Woodpeckers can excavate through hickory bark, leaving behind small pieces, and can remove narrow strips of hickory bark from already scaled areas. We have found nothing to indicate that Pileateds can go straight from outer bark to sapwood and remove the hand-sized chunks we’ve found under the scaled hickories in the search area. Detail of the hickory shown on the home page. Note the absence of blonding on the edges. Also note possible superficial bill marks on the lower right, a detail I had missed, and the targeted digging into the exit tunnels. All of this strongly supports the hypothesis that Pileated Woodpeckers are incapable of scaling hickories in the manner that I believe to be characteristic of Ivory-billed Woodpecker. I’d further argue that the absence of blonding on boles of any hardwood species may be suggestive of ivorybill, provided the bark is thick (over ~.5″) and tight. This is not to suggest that ivorybill work never shows traces of blonding. Though the image quality is poor, Tanner’s Plate 8 may show it. Something similar to blonding is visible in examples of scaling by other Campephilus species. Thus, an absence of blonding on scaled hickory boles may be a basis for rejecting Pileated altogether and may be suggestive of ivorybill when other tree species are involved. On a recent visit to a park in Orange County, New York, I found many EAB infested, blonded ash trees. I only had my iPhone with me, but I took some close ups and one shot of the chips on the ground. I also collected some chips and photographed them at home. One of these chips was particularly interesting; while it include some of the outer bark, most of it was from an intermediate layer, further illustrating how the bark is flaked off and that multiple events of stripping are involved before the cambium is exposed.